This blog is now more than ten years old (you can check the archives if you don’t believe me). I recently changed its title from The Widmann Blog to Denseman on the Rattis (check The Flyting of Dumbar and Kennedie if you don’t get the reference). I’ve also now moved it, changing its URL from blog.widmann.org.uk to widmann.scot. Given my continuing support for Scottish independence, I thought that was more appropriate. Last year I described how I used Delicious and Twitterfeed to post bookmarks to Twitter automatically. Since then, I got more and more fed up with Twitterfeed. In theory, it ought to check my links twice an hour, but often it would leave three to four hours between updates, which meant that my links sometimes got posted at 3am when nobody was around to see them. I was starting to think about writing a Twitterfeed replacement myself, when I discovered Twibble, and it’s much better. It has many more options — for instance you can specify posting times so that it doesn’t tweet anything during the night, and it can check for new links much more frequently. There are a couple of minor flaws — for instance, the posting times have to be specified in PST — but it’s nothing you can’t live with. The main problem is that Twibble isn’t totally stable yet: It has stopped posting twice since I started using it, but the support team is normally really responsive and helpful (during California daytime). I would definitely recommend Delicious + Twibble as the best solution for tweeting your bookmarks at the moment. arsp_046 by Anthony Ryan, on Flickr. 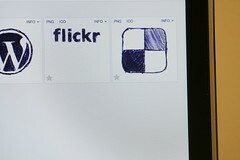 Just go to Flickr, find the sharing code, select “Small 240 x X“, then “HTML”, and paste the result into the text box on the left and click the button. The WordPress-style code will then appear on the right, and you can copy it and paste it into your blog post. It’s not quite as convenient as Flickr’s old system, but it gets the job done. 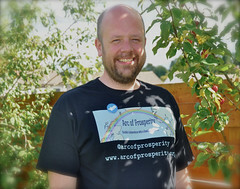 My new Arc of Prosperity T-shirt, a photo by viralbus on Flickr. As you’re probably already aware, the 2nd annual March and Rally for Independence will take place in Edinburgh on Saturday (21/09). I’ll be there, of course, together with my family. We went last year, too, and it was great fun. Have a look at my wife’s photos from the event. I hope to meet you there, and if you like this blog, please say hello! I’ve got myself an Arc of Prosperity T-shirt, so I should be easy to recognise. 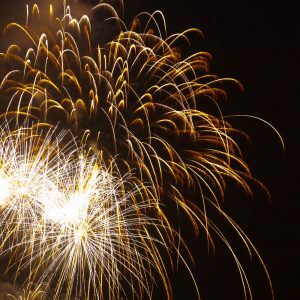 Author thomasPosted on 2013/09/14 2013/09/15 Categories blogging, family, politicsLeave a comment on See you on Saturday! 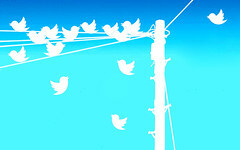 Multiple Tweets Gradient, a photo by mkhmarketing on Flickr. If you follow my political independence blog, Arc of Prosperity on Twitter, you will have noticed that I often tweet topical links, prefixed with the text “Seen elsewhere:”. This happens automatically when I bookmark a link so long as I add a certain label to it. To do this, I use two free websites, del.icio.us and Twitterfeed. 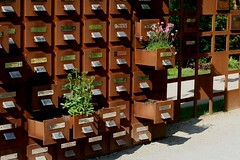 Del.icio.us is simply a bookmarking site that allows me to save bookmarks and attach labels. All links that I want to appear on Twitter get the label “aop”. (You can see all my aop links here.) The most important del.icio.us feature from this point of view is that you can retrieve these bookmark lists in RSS format (e.g., this RSS feed for my aop links). Twitterfeed posts RSS feeds to Twitter, so all you need to do is to tell it the address of your del.icio.us RSS feed and determine the posting frequency etc. Del.icio.us and Twitterfeed work really well together, and it’s my impression that many of my Twitter followers really appreciate the links I’m posting. archive_w_7295, a photo by Aureusbay on Flickr. Sometimes I write a blog post that I personally think is interesting but which gets almost entirely ignored, probably partly because I announced it on Facebook and Twitter at a time when most people were asleep. I have now partly solved this problem on my Arc of Prosperity blog by installing a WordPress plugin called Tweetily. Tweetily will randomly select a post and tweet it automatically (I’ve set it to do this every 12 ± 2 hours). I wasn’t sure what the reaction was going to be, but several of my “from the archives” posts have been retweeted and traffic has gone up significantly, so I think it’s been worthwhile in this case. 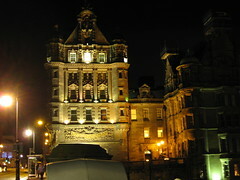 Scotsman Hotel, a photo by buhny on Flickr. Today The Scotsman announced that they will make a quarter of their editorial staff redundant, and The Telegraph have decided to set up a paywall. On a more positive note, Wings over Scotland’s fundraiser exceeded its ambitious goal, raising more than £30k. It’s clear that traditional journalism is in danger. However, I’m not really sure that the solution consists of paywalls, fundraisers, intrusive ads etc. The things is that in the “old” days (about ten years ago), I spent something like £1 a day on buying newspapers (slightly less on workdays and slightly more on Sundays). However, the advent of blogs and free newspaper websites has changed my behaviour — instead of reading all of one newspaper, I’m now reading 5% of 20. The money I can spend on reading news hasn’t gone up, so there’s no way I can spend anything near £1 a day for news. On the other hand, if I had to pay 5p per article or blog posting, I probably wouldn’t spend much more than I used to, and everybody would be happy. The problem is how to do it. I’m not going to set up subscriptions with direct debits or credit card details separately for the 50-100 news sites that I occasionally visit. The only solution I can think of is a way for newspapers and quality blogs everywhere to create a payment system together, whereby reading a news article triggers a payment from the reader to the writer of 5p or so. The system would then add up all the small payments and send the reader a monthly bill. However, it isn’t a perfect solution. Many websites would remain outwith this system (most small blogs and the BBC spring to mind), and there will always be a temptation for users to go for the free websites. The <canvas> element is not supported by your browser!